Welcome to our Innovation Awards series, where we give you the 101 on each of our six BizDojo resident businesses from across New Zealand who were finalists and Highly Commended in the 2017 Innovation Awards. Today we are giving you the quick rundown on Mevo! Curious about other innovation award nominees that call Dojo home? Then be sure to check out our piece all about BizDojo Christchurch business - Anteater, or our piece on the innovative world of toothbrushes with James Hurman. Do you like the environment? Do you also like the thought of looking super swish in a fancy car? It’s probably time you checked out Mevo then. Wellington-born and raised, Mevo is New Zealand’s first hybrid car-sharing scheme who are making some pretty big noises with some very quiet cars. Founded by BizDojo Wellington residents, Erik Zydervelt and Finn Lawrence, Mevo has been in operation since December 2016 and it's clear they’re here to stay. Their humble fleet of 3 in 2016 is on track to have more than 50 by the new year! Using a the Mevo service is beautifully easy. The Mevo app connects you to electric vehicles around Wellington, whenever you need them most. Whether you want to escape the capital’s winds in search of nicer weather (often!) or you got carried away at the supermarket buying 241 Anchor Blue, an Audi A3 Sportback e-tron is just two taps away. The car is all yours till you’re done and you only pay only for the time you use, from an hour up to three days! Mevo works on a membership plan which ranges from $11 an hour to $49 a week. Your insurance, fuel, maintenance and ongoing costs are entirely covered so all you gotta do is reserve a car and get zooming. 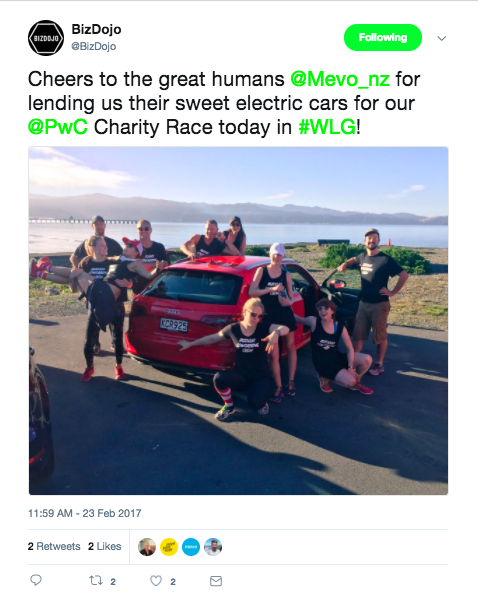 Not only is Mevo New Zealand’s first electric car sharing scheme but they’re pretty unique on a global scale too. Mevo is the world’s first climate positive car share, using responsible carbon credits to not only sustain but restore the environment they operate in. The BizDojo crew were lucky enough to check out their service first hand as Mevo's Audi's were our shiny chariots getting us from Wellington to Martinborough for the PwC Charity Relay earlier this year. We can testify that they make you feel pretty swish.